Spend any time talking salt water fishing and you quickly become aware of the “big ‘uns,” those deep-water behemoths that are the stuff of legends but almost never end up on the end of your line. Earlier this month Brandon Lee Van Horn of Panama City, Fla., was finally able to stop dreaming and start bragging. 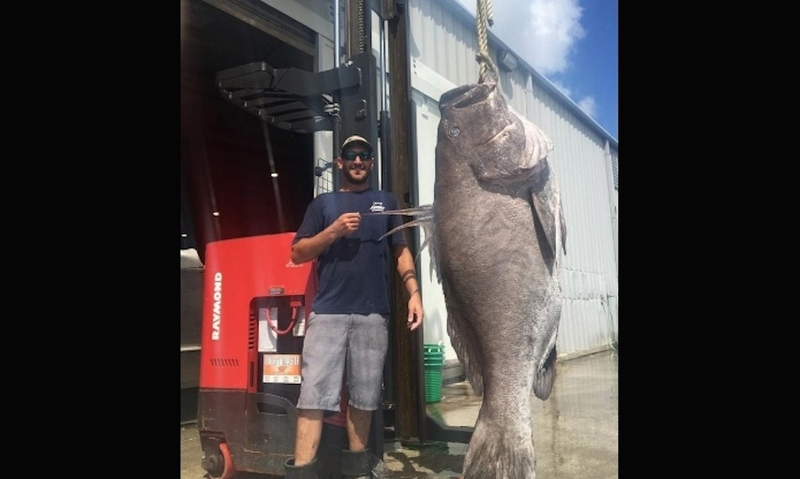 The longtime commercial fisherman, who began fishing on his grandfather’s charter boat at age 8, landed a 330-pound Warsaw grouper on Oct. 1. He caught the monster in 375 feet of water after a 25-minute fight to bring it to the surface. Van Horn, who fishes for a “little bit of everything,” mostly seeks out smaller species like vermillion snapper. Bigger fish such as Warsaw groupers can be difficult to land because they often break off or straighten out hooks once they’ve taken the bait, he told the paper. Warsaw groupers are among the biggest fish found in the Gulf of Mexico, growing up to eight feet in length and nearly 600 pounds. Van Horn missed the Florida state record by more than 100 pounds, to a 436-pound giant caught in 1985 off Destin, but he was still pretty pleased with his day. I wonder how many fried grouper sandwiches that fish will make. That is awesome. I have always wanted to see one of the deep-water groupers in person. I would love to see one in person, as well. Fascinating creatures, aren’t they?